Developing fitness is largely a mental game. The act of pushing through the pain of workouts, eating well and recovering outside of the gym requires and develops mental toughness. CrossFit's founder Greg Glassman once told Greg Amundson that "the greatest adaptation to CrossFit is between the ears." One source of mental strength for many CrossFitters is their spirituality. 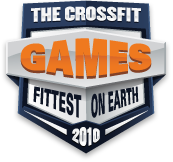 For example, each of the top 3 male competitors in 2010, Graham Holmberg, Rich Froning Jr., and Chris Spealler has acknowledged their Christian faith. In the Roundtable Discussion at the Rogue vs. Again Faster Tahoe Throwdown, Chris Spealler mentioned his faith. Chris is considered by many to be one of the most mentally tough CrossFit athletes, but it may surprise you to know that Chris has said that his faith is the "only thing that helps me with the psychological component of CrossFit." 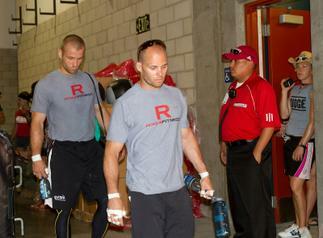 Dealing with the stress of CrossFit can be difficult for many Games competitiors. Chris deals with the stress of competition through his faith. He prays both before and after training. Contrary to what one may expect, though, Chris's faith does not spur him on in a quest for physical and spiritual perfection. Instead, Chris's faith is about "resting in God's grace and the fact that there is nothing I need to do to earn His love for me." This thought allows Chris to disassociate his performance from his self-worth. Instead of his performance, Chris wants his "relationship with Christ to define who I am." Training this way allows Chris to experience the "joy" of training, instead of worrying about how his numbers will stack up. Finally, while his Christian faith is extremely important to him, Chris wants people to know that no matter "where you are personally," it "doesn't affect my respect for you." Chris, You are awesome. I attended a service at Harvest Bible Chapel in Arlington Heights, Il and was kinda struck by the thought that being Christian and being "Cross"Fit apply both physically in the sense of the program as well as in the spiritual sense. While I have heard people mention using that idea as a platform to launch an affiliate, I feel that an acknowledgment of the irony and a smile is more appropriate, rather than diving into a Christian based "Cross"Fit approach. It negates people by implying exclusion due to Faith. What are your thoughts? 13 January 2011 / 5:15 p.m.
For I am not ashamed of the Gospel, for it is the power of God for the salvation of everyone who believes. 13 January 2011 / 6:47 p.m. Praise the Lord. Thanks for the great witness and example for us. I am excited to watch all three of you compete- Chris, Graham, and Rich. 13 January 2011 / 9:15 p.m. There are many overarching themes that criss-cross faith and CrossFit, and it is outstanding to have some of our top athletes proclaim their faith and love for Christ. CrossFitter's have a genuine love for people and a belief that we all can be better than we are. It makes our community rich with character, and to share it with fellow believers makes it all the richer for me. 14 January 2011 / 6:57 a.m. Your body is a temple, given to you by God. Crossfit has helped me to make my temple the best it can be. It is very disheartening to me when I see others that don't have any respect for the gift that was given to them by God. My life, my body (my gift) will not be abused by gluttony, slothfulness. 14 January 2011 / 7:53 a.m. This is amazing.. Live boldly. Praying for you guys! 14 January 2011 / 7:54 a.m.
14 January 2011 / 8:30 a.m. This is great. I'm struck by how both spiritual and physical fitness share common principles. In fact, I think communities of faith can learn a lot from crossfit about how to empower and sustain long lasting change. 14 January 2011 / 8:44 a.m. I am a Greek Orthodox Christian Priest that started CrossFit September 2010. I love it and love what it does for both my body and my soul! It is refreshing to read that the founder of CrossFit feels the same! AMEN! Now back to practicing my double unders! 14 January 2011 / 9:05 a.m.
Great stuff, Speal. Keep doing what you do! 14 January 2011 / 11:17 a.m.
14 January 2011 / 12:25 p.m.
14 January 2011 / 3:12 p.m. Awesome to hear the truth of God's grace being spoken from someone of position. 14 January 2011 / 4:18 p.m. Thank you Chris for being so comfortable in your own skin to share your reflections of your faith and how it fuels you. 14 January 2011 / 5:46 p.m.
One of the most humble and inspiring people on the planet. I am so lucky to know you! 14 January 2011 / 7 p.m. Yes, I love the humbleness of the people in this community. It`s inspiring, refreshing and cool. 15 January 2011 / 2:13 a.m.
Uhm...Cris is great, dont get me wrong and awesome representitive of crossfit. BUT- Why do u have to mix god/religion in to everything? 15 January 2011 / 6:43 a.m. I'm so proud that Crossfit as a community offers the opportunity to openly declare faith in God (or to be just as comfortable to not declare faith). The very spirit of what we do is a way to honor Him - acceptance of everyone, kindness, family, and good clean WORK. He has given us these incredible self-propelled bodies, and Crossfit gives us a way to keep them perfectly conditioned. 15 January 2011 / 10:25 a.m. I've never seen or heard any of these fine Crossfitters use their platform to push their spirituality on anyone. As a fellow Christian and Games competitor, when you have the inner power source of God in your being, you can't help the fact that that reality bubbles up for others to see. Just can't be helped. 15 January 2011 / 10:36 a.m.
Josh and I talk often about the connection of our faith and CrossFit and our purpose in life. Life is ultimately about the relationships we make, and CrossFit has allowed us to connect with so many different people that we probably would have never had the chance to meet. Chris, I admire you in so many ways, thanks for always being so open about your faith and spirituality. I wish I would have been more vocal about mine during the '09 Games. Praying before and after every workout was what truly got my head through those 2 days. Knowing that I could only do my best and give everything i had to offer with the peace that I was not in control of what everyone else was doing... no matter what the outcome I was right where God wanted me to be ...and ultimately his love for me was more important than anything I could do at that ranch. 15 January 2011 / 12:52 p.m.
Chris, I have nothing but respect for you and your perspective on things. Keep doing what you are doing. Thanks for sharing your view. 15 January 2011 / 5:18 p.m.
great to hear, and thank you to HQ for making it known. God Bless, gentlemen. 15 January 2011 / 6:22 p.m.
Chris, as I told you at the CPC in Dallas, it is awesome to see such a humble yet bold stance for the Kingdom. 15 January 2011 / 9:25 p.m. I admire Chris, Graham, and RIch for coming forward and acknowledging this. I am upset that I worry what people think of my faith and me as a person so much that I have never mentioned it( my faith) in the CrossFit Community. Maggie took a picture of me standing over my barbell with my eyes closed before the thruster/ pull up workout at the 2008 Games just after DaveC announced 1 minute to start of the heat. When we got back to Virginia, she asked me what I was thinking about or what was going through my head, I couldn't even share with her the truth that I was praying for strength and guidance. With Chris, Graham, and RIch's lead, I feel a door has been opened and I am happy to walk through it them. 16 January 2011 / 6:20 a.m.
Chris, you are truly an inspiration to all of us! Thank you! 16 January 2011 / 6:12 p.m.
Hey just wondering if you could help me. When i first meet my husband he was addicted to fitness (gym) not long after i met him he found crossfit and it become his next god. He became a born again christian and wanted to turn his addiction into his passion through God. But with no one here where we live to mentor him to use crossfit and his gifts to glorify God and build his relationship with God. I was wondering if you could help me help my husband to lean more on Gods understanding then his own strength. Is there any christian books you guys have read that have helped or speakers or even verses??? 16 January 2011 / 10:17 p.m.
16 January 2011 / 11:02 p.m.
First, thank you guys, for being bold enough to say these things about Christ. There is quite a lot of opposition to Him in the world...but getting to know Him is worth it! Laurie, I would offer "One Place" as a helpful web site that has several pastors there to listen to. My favorites are James MacDonald and Charles Stanley, who are very educated in conveying biblical knowledge. 17 January 2011 / 7:45 a.m. Grounded in faith, uplifted through spirit... RESPECT! 17 January 2011 / 8:54 a.m.
We are fan of you! Sure there are your performance and pleasure to watch you when you do a wod but not only for these reasons ... we was not wrong here when we can feel you're a great guy with good values and a mindset. .. what is less obvious for us to perceive that are not fully bilingual compared to those who understand you perfectly even you speak quickly or slowly. For us, listen to an interview or videos from crossfit journal takes 3 times longer ... play, review, play, review ... 20 times and sometimes more! Can you say hello from us, Mike Burgener because we love him very much! 17 January 2011 / 11:56 a.m. I am so blessed to have CrossFit and God in my life. This was so wonderful to read! Thank you for being open and honest about your faith! 18 January 2011 / 9:23 a.m. I think that Speal is an amazing athlete and this was an interesting article. That being said we believe things in everyday life because there are reasons or evidence for believing them. We all make normal daily choices based on rational thinking. Relying on faith means turning off that rational thinking, ignoring facts for the sake of fantasy. It is to believe in spite of no evidence. Since there is no evidence for a god belivers are supposed to have faith that one exists. Yet they would not use that same blind faith as a guide to reality in any other aspect of their life: they would be called naive and irresponsible. 20 January 2011 / 11:39 a.m.
Rock on guys, this post is so inspiring and contagious! Thanks for being bold! Dear Buddha, you can't see wind, only the effects of it, does that mean people dont believe in it? 16 February 2011 / 8:44 a.m.
13 May 2011 / 8:52 a.m. It will continue to become more difficult to express faith in Christ. Chris, when you compete we can "hear" the music of The Chariots of Fire. 14 July 2011 / 10:38 p.m.
Wow, this is awesome. As a fan, I have always been blown away by Chris' awe inspiring ability as an athlete and even more so by his class, professionalism and humility. After reading this article my respect is even greater. Thank you for being a positive role model and for the example you set. 15 July 2011 / 10:37 p.m.
@Kelli that's a silly argument. There's a scientific reason the wind blows. I believe its because of the sun but dont quote me on that. You argument makes no sense. Jesus is a regurgitation of the Pagan god MIthra who came 600 years before jesus. Coincidence? I think not. Look it up. 27 July 2011 / 8:01 p.m.
To the Buddha. With all due respect You cannot compare the faith one has in God to having the same faith one would have to any other aspect of life. For those that believe God exists have no problem accepting his position as creator of all, the only one perfect and without sin. Therefore having such blind faith, as you call it,which is not blind at all as you will never see as clearly as you do when You have faith and believe in God, cannot be applied to other daily activities, as why would you put that same faith into the imperfect. Your argument is therefore flawed. 28 July 2011 / 2:28 a.m.
05 August 2011 / 11:45 p.m. Thanks, Speal for your boldness. I had no idea he was Christian until I stumbled upon this article. As I crossfit and take on other physical endeavors such as barefoot running I realize more and more what a tremendous gift our bodies are. Btw, Bear Grylls is Christian, too. 14 September 2011 / 12:43 a.m. Truly a gift to find there are CrossFitters proclaiming the Name of Christ. Christ is the reason we should take care of our bodies. We are called to minister to and love others. It is easier to do this when we're alive and well. 24 January 2012 / 1:52 p.m.